a spot of whimsy: Wedding | Bridal Party Garland. 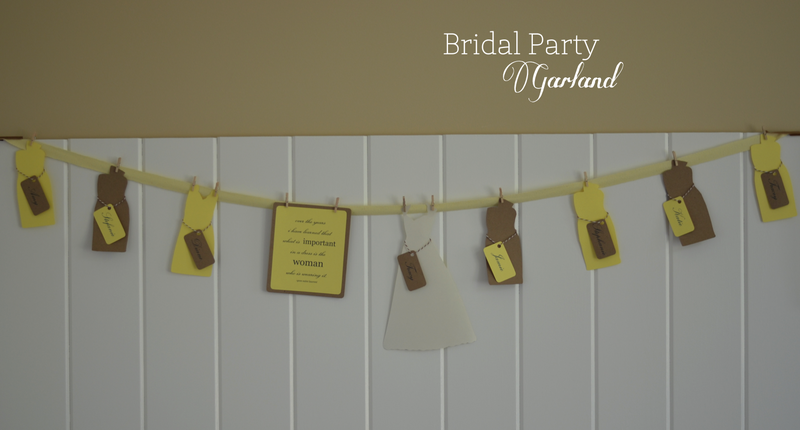 Wedding | Bridal Party Garland. File this under unnecessary but pretty and a sweet touch: a little decoration for the bridal party's dressing room. Cause why not add another personal somethin-somethin? I created this one for my sister's wedding last summer. I began by printing 8x10 pictures of her wedding dress and our bridesmaid dresses. Taped 'em down, traced 'em up. Her colors were "honey and wheat," so I went with kraft paper and a pale yellow for the dresses, and a creamy white for the bride. I used a long piece of pretty ribbon and some miniature clothespins to attach the garland together; both can be found at any craft store or even on Amazon. I played with spacing until I liked it - there's no wrong answer here. I found the above quote very apt, and decided to incorporate it in. And then because I can't stop brainstorming, I added little tags to each dress for each of the bridesmaids (and of course the bride). If you were making one of these for yourself and were so inclined, you could send your bridesmaid home with her little figure. A teeny memento of the day! omg that is the most adorable thing EVER ! Yes yes yes!!! I seriously love this!